Working together to better the community! ​WILLARD, Mo. School is out for the summer, but the work is just getting started for those tasked with keeping our kids safe. 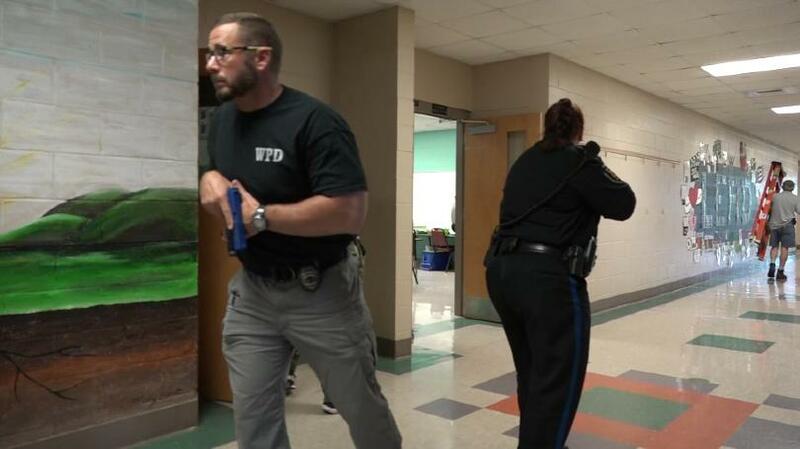 Willard Police spent the day Tuesday training inside three school buildings across the district. "These officers literally don't get in our schools. This school (Willard Central Elementary) is right on our border, and this is a way for them to learn the building and get some training at the same time," said Willard School Resource Officer Clint Heimbach. Heimbach and other school leaders said they saw the need to bring officers in and familiarize them with entry points, exits, classrooms and layouts. The officers also teamed up for training for active shooter scenarios. While it may be the worst case imaginable for any community, it is one that's been proven possible across the country with tragedies like the most recent one in Texas. "It's been nerve-wracking, because we're responsible for 4,600 kids at Willard, and we want to make sure they have a safe learning environment at all times," said Dr. Derrick Hutsell, the assistant superintendent of Willard Schools. "I realize my job's very important and that we need to keep training, and we need to be prepared for that day. Hopefully it never comes, and we never have to use any of the training, but we have it in case we need it," Heimbach said. Heimbach said the school district intends to continue with its renewed focus on security in the future and set up more in-depth training for both their teachers and students. ﻿﻿The City of Willard Police Department has established a great working relationship with the community. The community's ideas and values reflect on the Police Department and how it functions. City government believes in the "community" (all parts and aspects of the community) and with this a strong working environment with the Police Department. This creates a positive working environment with the community and therefore enhances the quality of life in Willard. The Willard Police Department strongly believes and is actively involved in the concept of "Community Oriented Policing". The Police Department strives for a proactive response to crime and looks toward community involvement in order to function effectively. The Police Department is located at 795 Hughes Road and operates twenty-four (24) hours a day seven (7) days a week. Administrative office hours are Mon- Fri 8AM to 4:30PM. The Police Station was dedicated in May 2002 as the "Joe L. Cosby Law Enforcement Justice Center." Along with the Uniformed Patrol Division (comprised of 10 full time Police Officers, 2 Civilian Employees, 6 Reserve Police Officers and 2 School Resource Officers who are commissioned by the Department but receive their pay and benefits from the Willard School District), the Police Department has two (2) certified investigators, a D.A.R.E Program and the Police Athletic League (PAL Program).